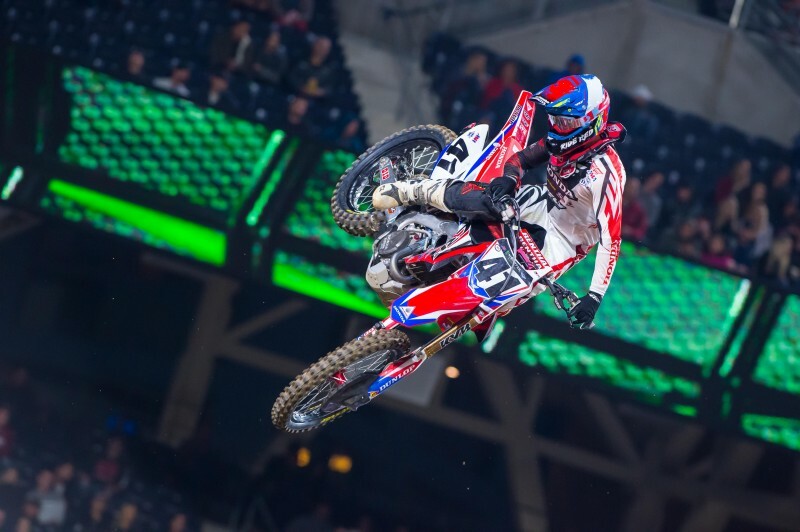 Although Team Honda HRC had hoped for more at the first of two 2016 stops at San Diego’s Petco Park, the squad was pleased with Cole Seely bringing home another third-place finish and is optimistic moving forward. 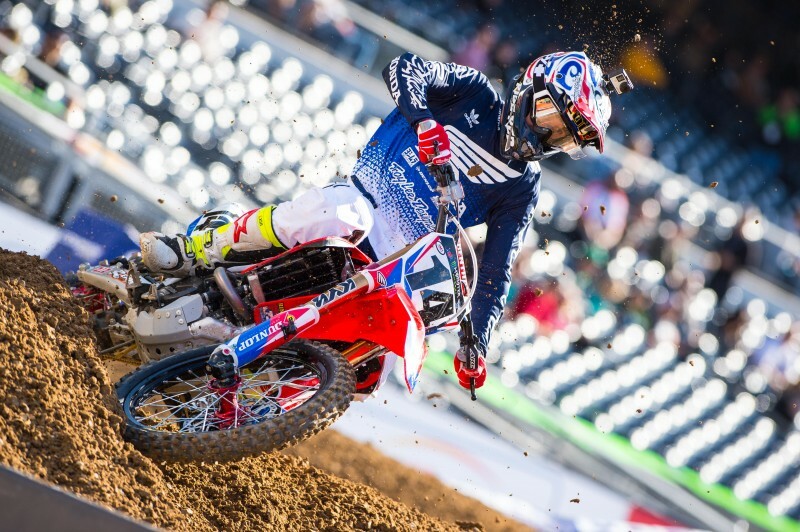 The Californian completed lap one in seventh place and quickly began navigating his CRF450R toward the front of the pack, moving into third on lap six. 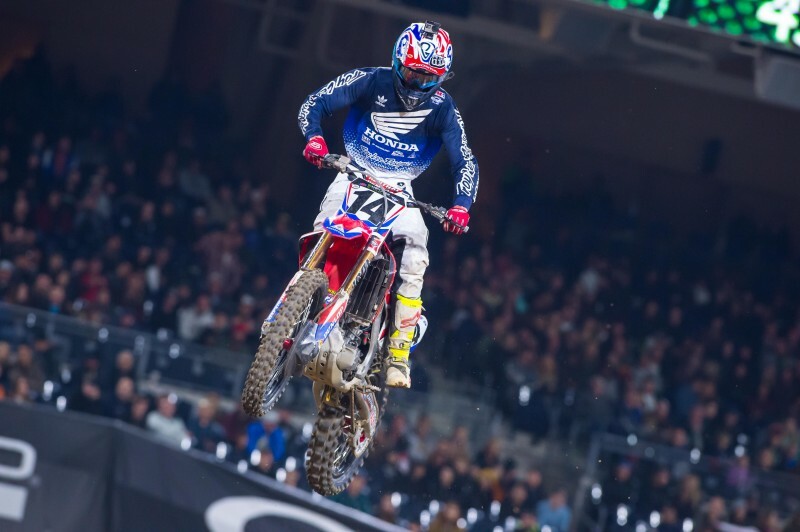 Near the end of the 20-lap main event, a heated battle ensued with Jason Anderson, and Seely relinquished one position, taking the checkered flag in fourth. 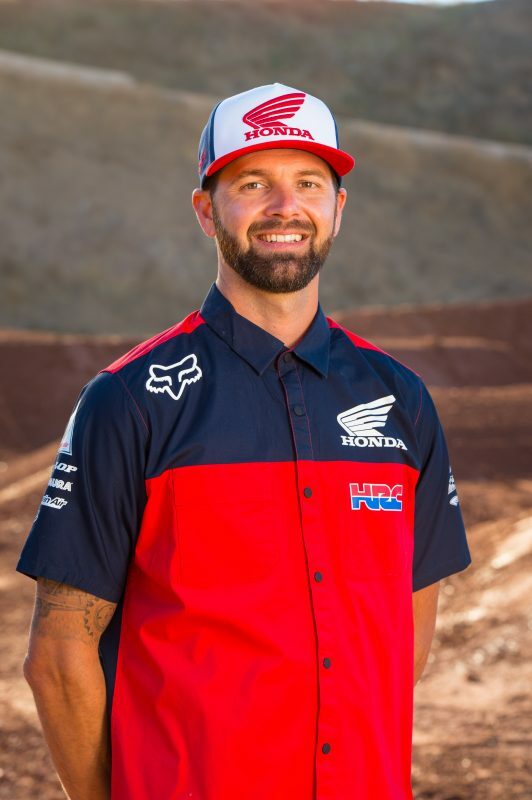 However, after further review by the AMA, it was determined that Anderson had jumped during a red-cross flag; he was subsequently docked two positions, officially moving Seely back into third. Following a less-than-desirable start that left Trey Canard 15th on the opening lap, he was able to put together a solid come-from-behind performance to salvage a seventh-place finish. 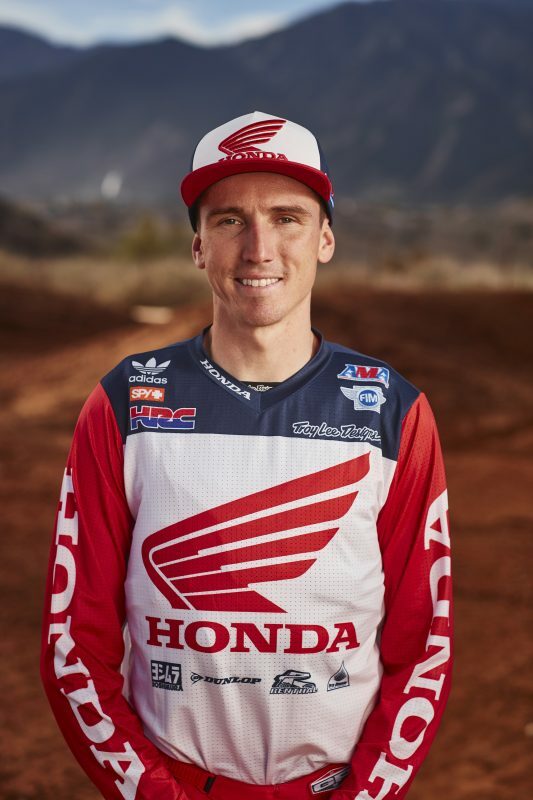 Prior to Saturday’s action, Team Honda HRC’s Trey Canard and Cole Seely joined GEICO Honda’s Justin Bogle, Christian Craig, Jimmy Decotis and Jordan Smith for an appearance at Motoworld of El Cajon to hang out with fans and sign autographs. 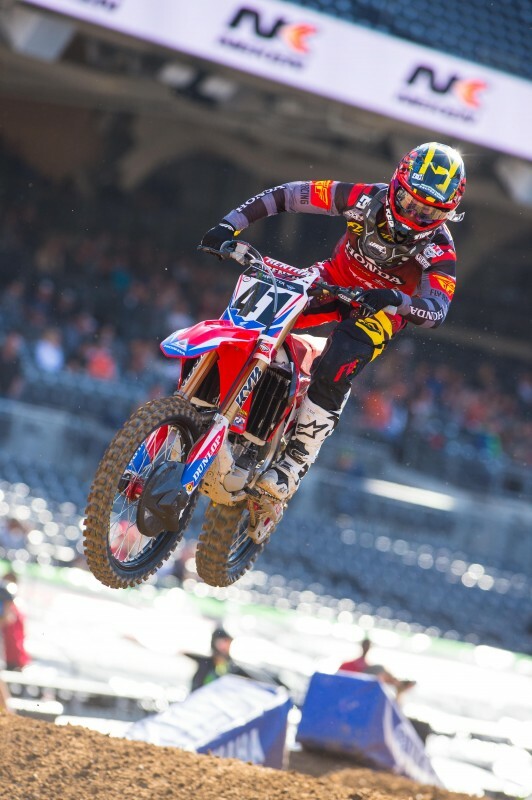 Honda has a successful history in San Diego, with a total of 14 victories—more than any other manufacturer. Honda also has the most San Diego podium sweeps in both classes, at six: 1987, 1990, 1991, 1993, 1996 and 2011. 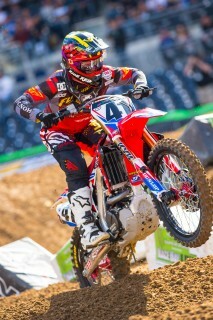 During the day’s timed qualifying practice sessions, Seely was eighth with a 49.190 lap, while Canard was tenth at 49.634. 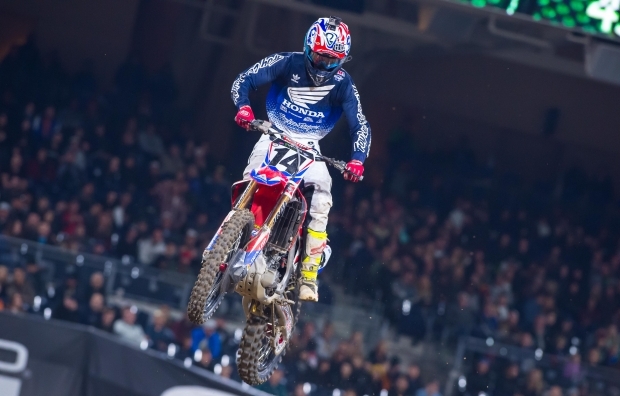 Seely and Canard were slotted in 450SX heat one along with fellow Red Rider Bogle, and the two Team Honda HRC racers were sitting 5-6 after the completion of the first lap. 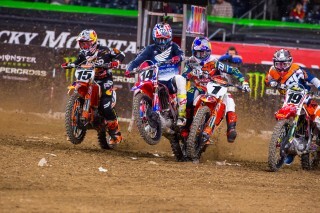 Seely began charging forward, ultimately landing in third and transferring directly into the main event. 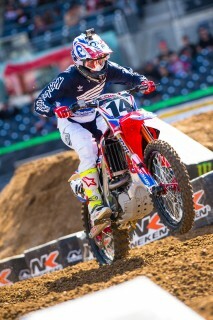 Although Canard was forced to qualify through the semi, he laid down the second-fastest lap time during the heat race. With 40 points, Seely now sits third in the championship, just one point from second. Canard is seventh with 28. This weekend, the Honda Red Riders head back to Anaheim for Angel Stadium’s last stop of the year. On Friday, the riders will take part in a dealer appearance at Huntington Beach Honda from 6-7:30 p.m. So pressure-filled and scrutinized is the season opener—for both riders and team staff—that last week’s race can almost be considered a separate entity from the rest of the AMA Supercross series. That being the case, the second round can be viewed as the first of the “normal” races. 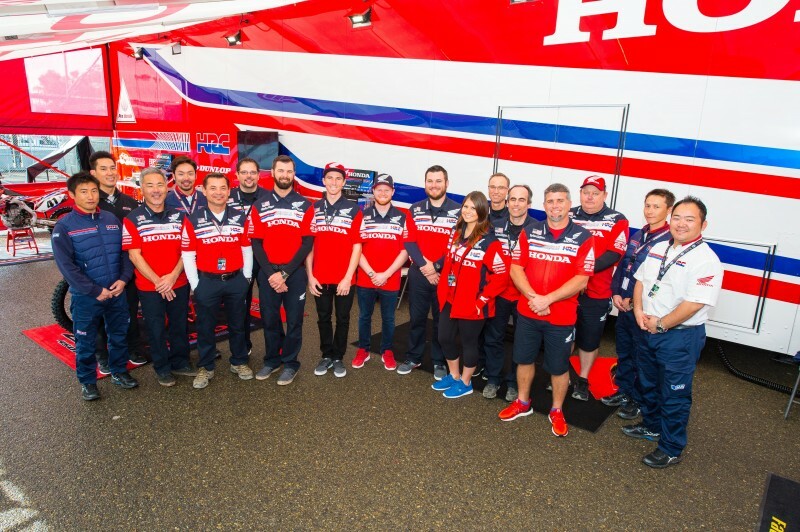 Granted, it’s still too early to say that Team HRC is completely settled into a groove, but compared to Anaheim 1, nerves were calmer in San Diego, and the routine a bit more familiar.